Oil on canvas, 192 x 270 cm. With this depiction of Bondedammen pond by the town of Hellebæk, Denmark, P.C. Skovgaard has painted a scene from Danish nature that appears as something out of a summer’s day in Arcady. The sun’s golden rays illuminate a lush forest landscape just after a rain shower has passed. A peasant girl and boy watch their cows quench their thirst by the pond, while grey rain clouds can be observed on the horizon. During his stay in Italy, Skovgaard became deeply inspired by Claude Lorrain and his Arcadian landscape paintings. This fascination subsequently manifested itself in the Dane’s landscape paintings of his home country’s nature on the island of Zealand. 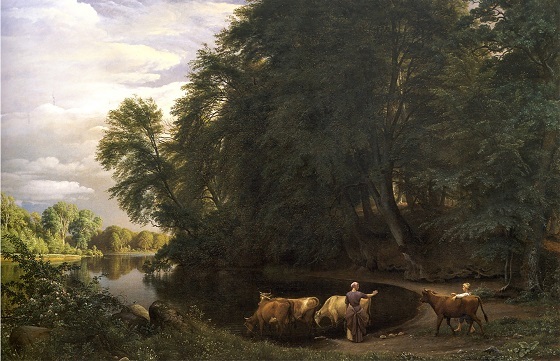 In this painting of Bondedammen, the still waters of the pond, golden afternoon sun and the peasant children bring to mind Lorrain’s paradisiacal landscapes where herdsmen live in harmony with an idealised version of nature. In using these elements, Skovgaard ‘rediscovered’ distant Arcady in his figurative backyard, the nature of Denmark.